This paper describes a Gaussian Process based machine learning technique to estimate the remaining volume of cast iron in ageing water pipes. The method utilizes time domain signals produced by a commercially available pulsed Eddy current sensor. Data produced by the sensor are used to train a Gaussian Process model and perform inference of the remaining metal volume. The Gaussian Process model was learned using sensor data obtained from cast iron calibration plates of various thicknesses. Results produced by the Gaussian Process model were validated against the remaining wall thickness acquired using a high resolution laser scanner after the pipes were sandblasted to remove corrosion. The evaluation shows agreement between model outputs and ground truth. 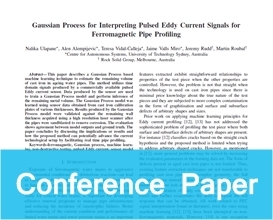 The paper concludes by discussing the implications or results and how the proposed method can potentially advance the current technological setup by facilitating real time pipe profiling.